We've been sitting on this sweet news for about a week now, waiting to scoop some art or something from the production comapny before we reported on it, but since it seems fairly clear that it's about to break we're muscling forward. Yes, you read the title correctly. 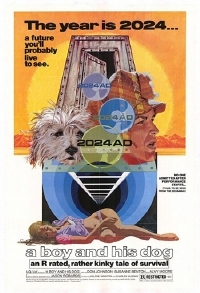 Harlan Ellison's post-apocalyptic short story, "A Boy and His Dog," the one that was made into a movie in 1975 and the very same one that the Japanese want to remake, is heading to the screen as an animated feature. The man behind it? Long-time Writer / director / producer David Lee Miller. Writer / director David Lee Miller was on our radar last year for his stellar comedy / drama, My Suicide, (review), but he's been in the industry for years. In fact, Miller worked as Second Assistant Director on the Roger Corman produced disaster pic, Avalanche, way back in 1978. So the material would appear to be in good hands. The film is currently in pre-production with a tentative 2012 release date, but it's official. We've spoken with Miller and he seems pretty intent on making the project so let's all hope we get more from him soon. Great movie for it's time. I love the telepathic dog. I hope the remake does it justice. Oh no! A Boy and His Dog is one of my all time favorites. Both the movie and the short story had a huge impact on me as a kid and launched my love of the PA genre. Does this really need to be remade? There are so many great stories waiting to be filmed (PKD's Dr. Bloodmoney, Spinrad's The Big Flash, Earth Abides) do we really need to remake already great films? Chuck, my history with "Dog" is the same as yours. But, saying that, i can see this working as an animated feature. It was always gonna happen, so i would rather they chose the animation format than the original. Mr Miller may actually pull this off with his background, i remain optimistic, especially as the alternative could have been a Japanese version.